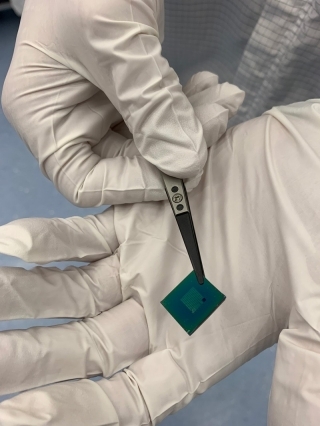 With silicon-only semiconductors’ potential now exhausted, researchers have been looking for something else to increase carrier mobility. A silicon-graphene device that can transmit radiofrequency waves in less than a picosecond at a sub-terahertz bandwidth could be the solution. Tingyi Gu, an assistant professor of electrical and computer engineering and his team at the University of Delaware, is developing cutting-edge technology for photonics devices that could enable faster communications between devices and thus, the people who use them. Their work is described in a new paper published in the journal ACS Applied Electronic Materials. “In this work, we explored the bandwidth limitation of the graphene-integrated silicon photonics for future optoelectronic applications,” said graduate student Dun Mao, the first author of the paper. By combining silicon with 2D graphene, a single layer of atoms that has more favorable properties than silicon alone, including better carrier mobility and direct bandgap, the scientists hope to use already-developed silicon device technology that will work significantly faster. To combine silicon with graphene, graphene is placed at the p-i-n junction, an interface between the materials. This optimizes the structure to improve device responsiveness and speed. This method is robust and could be easily applied by other researchers. The process takes place on a 12-inch wafer of thin material and utilizes components smaller than a millimeter each.